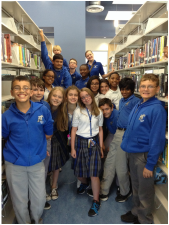 BRiMS is a book group made up of students in grades 6th though 8th who love books and reading. Meetings are held on the last Wednesday of the month during lunch, and a special snack is provided. BRiMS was formed on February 29, 2012. For the last meeting of the year, we decided to go online to read fan fiction. The first thing that we talked about was how appropriate or inappropriate the stories might be for readers, and yes, sometimes they are not appropriate for middle school. The students like fan fiction for how a story can be looked at from another point of you. Like hearing the Harry Potter stories from Hermione's point of view, or finding out what happens to Junie B. jones as she grows up, or what happens in the world of Panem before the 74th Hunger Games. The students also liked that they could find stories related to favorite video games, tv shows, movies, books, movies, cartoons, anime, etc. This was a lively discussion that focused on many different genres and mediums. Today we talked about adventure books. Adventure stories are fun to read because they live on your mind, capture you into another world, are not boring, and move fast. At least that is what the students believe. Howl's Moving Castle by Dianna Wynne Jones was the book selected for this month. Some students had seen the movie but not read the book. There was a general consensus that students liked the story whether they experienced it in book or movie form. One student said that it had everything a book needed to be good. They all seemed to love the fantasy and adventure elements. Several students thought that they would like to own a pair of seven league boots. Howl's ability to disguise himself was also a big hit. We had to postpone our meeting a day due to the winter weather that closed school for two days. Crazy, that happening in southern Louisiana. The students were given the task to read a science fiction book for this meeting. Some did by selecting a Star Wars book, others found a sci fi manga book that spoke to them (the Maximum Ride manga series was read by several members), and others talked about the videos that they watched online or on Netflix. A few students selected books that might be considered horror or fantasy rather than sci fi. We take the "reading" very loosely in the book group. Following a story is more important than the act of reading because this group is suppose to be about fun; it is not suppose to be a chore. Want to read more science fiction titles? Open here to visit this list of recommended sci fi books on Good Reads. Since not all group members had a chance to read the Dragon Rider, the discussion revolved around dragons in literature. in the back of the book is a discussion about how dragons are viewed in various cultures. The group were fans of the benevolent style of dragon found in this book and very often in the Asian cultures. 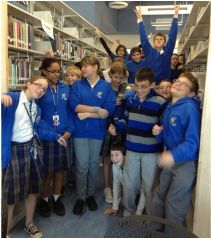 The students had a great time sharing the books that they had chosen to read in October. Some explained how they did not like to be scared, so they try to avoid horror. One student shared a story that he found on creepypasta. He said that he loves reading stories online and found lots of horror that he liked. For the second meeting of BRiMS, the students sat down with their lunch and chips with salsa. 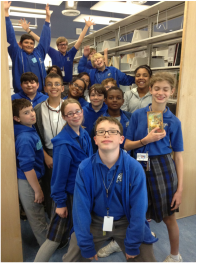 They had selected the book, Wonder, by R J Palacio for everyone to read. Since some of the students had not read the book or had not finished the book, Ms. Kahn shared a video book trailer and an audio interview with the author about the book to share with the group. 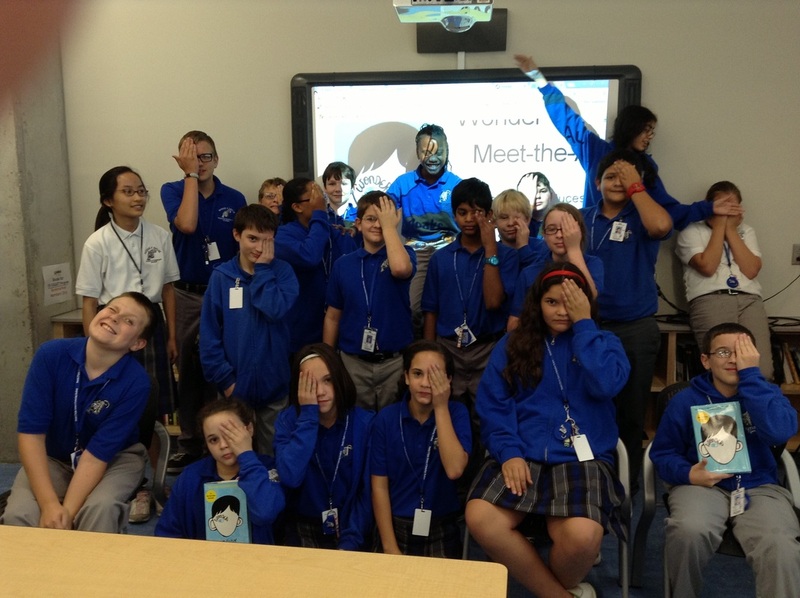 Students were also asked to sign the pledge to be kind, a movement that has taken off since the book was published. The kids loved the way the story was told from the point of view of several characters. We discussed how we would react to meet someone like Auggie, and some of the students thought it would be difficult. 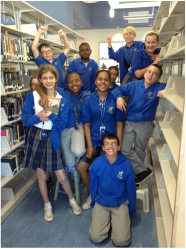 The students who had not read the book were excited to get a copy and read it. 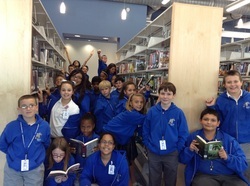 On August 30th, the first meeting of the year for the middle school book group was scheduled in the new library.Twenty-two 6-8 graders attended the meeting for this club's first event of the year. Students were able to bring their lunch to the library, and were served a snack of popcorn, too. We introduced ourselves and shared favorite books or favorite genres. The majority of the students are into sci fi and fantasy. In the past, students all read the same book for our monthly meetings, but when we voted on whether to continue this tradition about half wanted to read their own choice. The group will do a combination with some months having a required book and other months a required genre.